Winter of 2018 has been going through some tragic times. Our current weather pattern has been seasonally warm, with unpredictable weather, that has people questioning how it will affect the future. 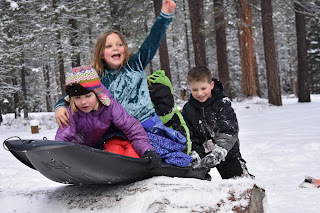 Finally we had enough snow to sled by the end of February! In 2017 we had a different problem with winter we had TO MUCH SNOW. Last year we had to delay our winter performance because of the road conditions. But this year we hardly had any snow on the performance or on Christmas, New Years, and Groundhog Days. We had some snow on Valentine's Day and Presidents Day, lets hope this weather will stay snowy (luckily it did! and then warmed up and now its mostly melted). Before we got our snowfall we were having 60° weather. People were wearing shorts and tank tops. Then out of nowhere we got WIND and more WIND and RAIN and more RAIN and than SNOW and more SNOW. I wonder what kind of weather our changing climate will bring us next winter.